Leave multiple mice on a pc and automatically swap buttons on each mouse. Have a left-handed and a right-handed mouse always connected and ready to use. Match speeds across different mice, ie touchpad and mouse with different speeds. Accommodate left and right handed users easily on multi-user or public workstations. v0.48 - No external files created! Mighty fine piece of software ya got there, thanks for writing it. Please post feedback as i'm new to AHK as of january, have been loving it making a different application . . Does that mean your intererested in making other scripts? Not to take advantage of your generosity, and some say it can't be done, but can you separate the mice in a different way, two mice actions? I could probably make enough money to retire selling 'gwarble' tee-shirts. I can go on to ask (selfishly) Can you differentiate between two keyboards? Menu, Tray, Tip, % " `n  EitherMouse " Version "  `n "
IniRead, FirstMouse,  EitherMouse.ini, Assignments, First  Mouse , % " "
IniRead, SecondMouse,  EitherMouse.ini, Assignments, Second Mouse , % " "
Gui, 1:Add, Picture, x32   y55 w32  h32 Icon1 vGuiPicL, % "main.cpl"
Gui, 1:Add, Picture, x64   y55 w32  h32 Icon1 vGuiPicR, % "main.cpl"
GuiControl, 1:, GuiText, % "Now move the`n" SwappedDesc2 " mouse"
GuiControl, 1:, GuiPicR, % "main.cpl"
GuiControl, 1:, GuiPicL, % "main.cpl"
GuiControl, 1:, GuiTitle,  % "Success!" GuiControl, 1:, GuiTitle2, % "Both mice assigned"
Gui, 1:Add, Picture, x68   y3 w32  h32 Icon1, % "main.cpl"
Did you try any of the saving/installing/shortcut options?? Mouse control panel? Thanks again for trying and replying! I'll have to play with this later. Looks great, though. It will indeed answer many questions about using a second keyboard for hotkeys. This might really interest me since I use a German keyboard externally, but a US keyboard on my laptop. I could then get it to switch my keyboard layout depending on what I'm using, so I have less frustration when undocking. Windows XP SP3 - When using the left mouse and CTRL or SHIFT to select multiple items in an explorer list, the buttons become unswapped. They revert back as soon as either key is released. Windows 7 (Fast User Switching) - Every time I'm returned to the welcome screen and reconnect to my session the left mouse buttons unswap. As far as I can see you have to delete the eithermouse.ini and rerun the setup to get it working again. I notice that a different pair of numbers is supplied each time I have to go through this process. * Wildcard: Fire the hotkey even if extra modifiers are being held down. This is often used in conjunction with remapping keys or buttons. This was exactly what I was looking for, although my intended use is different. To prevent RSI problems, I like to have two mice, one right, one left, and use them alternate. And your tool allows me to do just that! Even in Windows Server 2008 R2 and even in Hyper-V images I run on that! So, thanks! sweet, i'm glad to hear it! 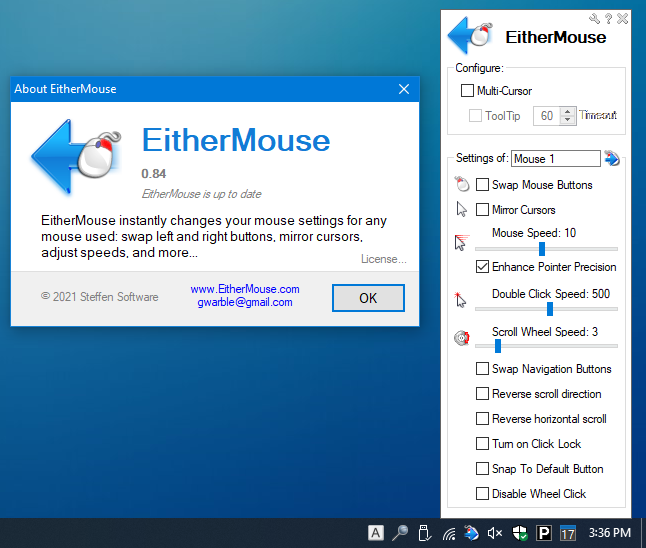 EitherMouse is the program I have been looking for for more than a year! My husband has been nagging (!) me to find exactly this solution as he sometimes wants to use his left hand to avoid repetitive strain injury/pain/discomfort. I found your site via the AHK forum. Pity it doesn't turn up easily on google. I can't even seem to get to the EitherMouse page via the home page of your site! Considering its quite a niche software, I thought I'd drop you a note to say thanks. Hey with this would it allow me to have one mouse run at a different speed? Like say I have the right mouse pointer speed set at default in the mouse settings and if i move the left mouse then the speed changes to fast, and when I switch back to the right one it changes back to normal? And is it posible to have the left mouse buttons be the same as the right mouse? great program, I really need/want the speed adaptation, I guess is not so hard to do because I remember seeing mouse speed changers and this great script already detects when you change mouse, so only add a speed change command is needed.